Learning a foreign language is an incredibly valuable skill to have. Not only does it open you up to another culture, and mae you able to communicate with a whole bunch of different people, it can also be a rewarding career. 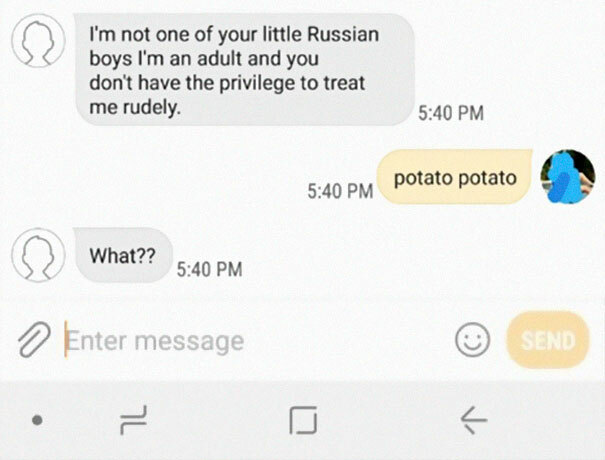 The following exchanged was posted to Reddit by a professional translator and tutor named Anna Noblesse, and shows an unbelievably frustrating conversation with someone who doesn’t grasp the concept that you’re not entitled to someone else’s labor, just because your brother is her boss. “think of all the points you’ll score with the boss” – how insulting. Boss points don’t pay the bills, lady. 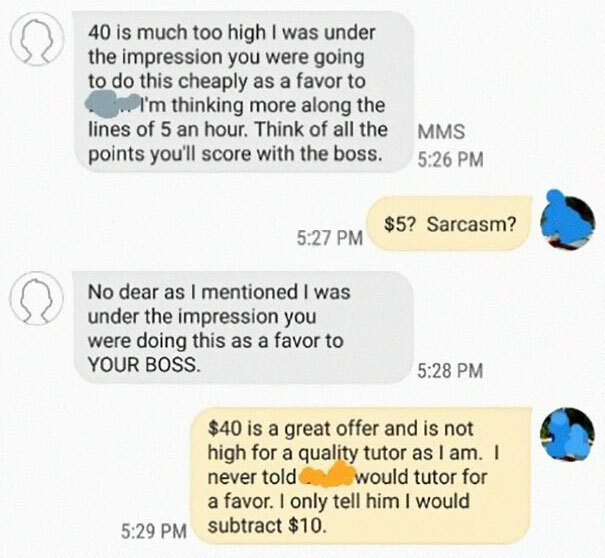 $5 is an insult, and her negotiation skills leave a lot to be desired. 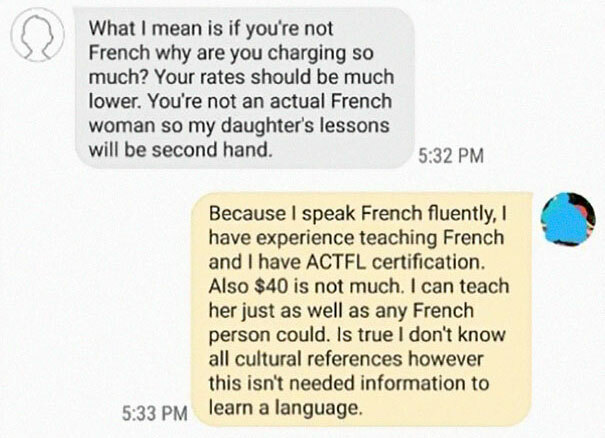 Apparently, this woman is blown away by the fact that non-Americans can learn foreign languages to a point where they can teach others. Who knew?! Even after Anna has cited her impressive qualifications, this dumb ***** is still not getting the message. Again – recommendations don’t pay the rent. And these “recommendations” will probably be as miserly as you are. This is where it really goes above and beyond – threatening to get Anna in trouble with her boss, thereby threatening her livelihood. This is outrageous. 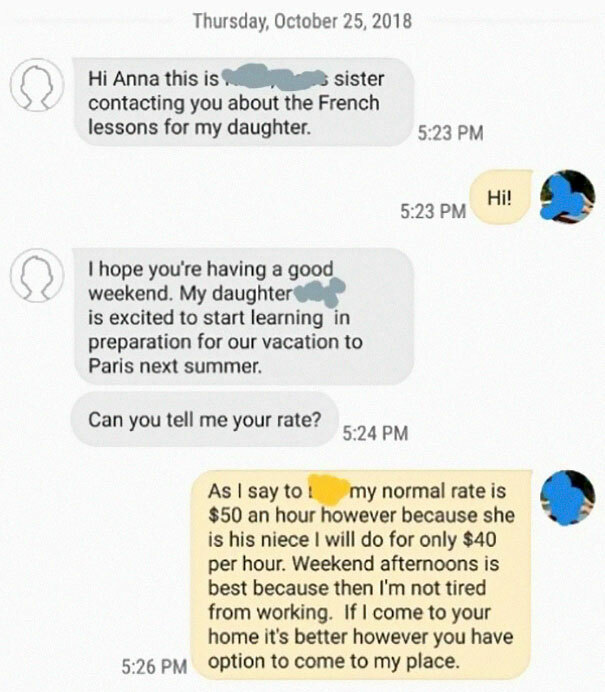 So, in summary, this woman demanded the French teacher’s labor for a ridiculously short price – an EIGHTH of her already reduced rate. 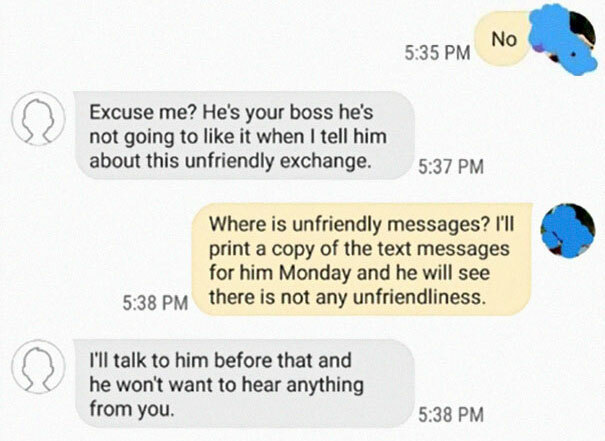 Then, when she rightly refused, she threatened to get her in trouble with her boss. I don’t like to use profanity on this website, but let me just say, this exchange has made my blood boil, and I’m struggling not to curse. 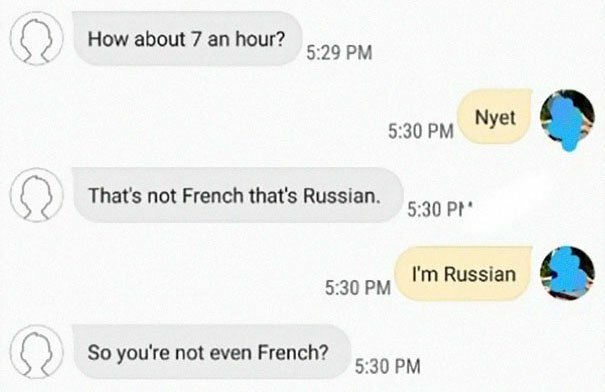 This woman has already sapped her of time with this text exchange – kudos to Anna for keeping her cool. 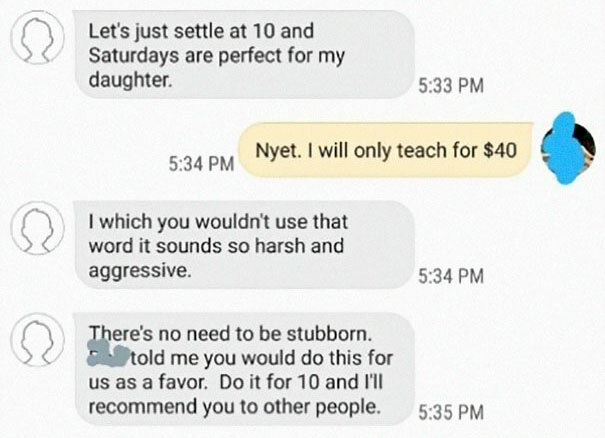 Let’s be clear: You are NEVER entitled to someone else’s labor, unless you both agree on a price. They don’t owe you anything. 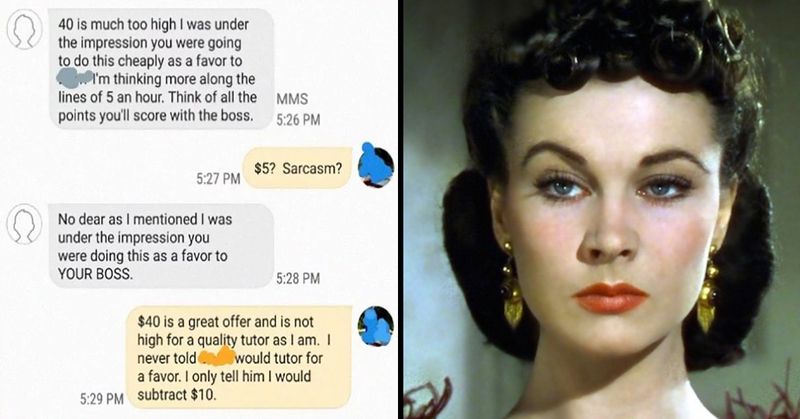 It’s especially insulting given that this teacher was highly-qualified, and spoke fluent French, and this woman still expected her services for pennies. What do you think of this, folks? Surely there is no reasonable person who can defend the actions of Anna’s boss’s sister? Let us know your thoughts in the comments.